Each New Year brings an opportunity to let go of the past and start fresh. What better way to start anew than clearing out clutter from your home? Whether you need to clear a pathway through your garage, clear out some space in the shed or open some room in your office, creating a more tidy living space can do wonders for your organization and mental health. At Mr. 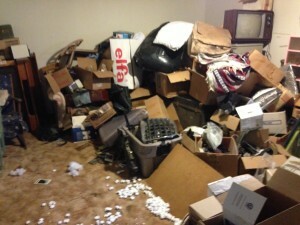 Junk, we can haul away the biggest or smallest piles of clutter and we serve the entire Atlanta area. Of course, it’s not up to us how much you hang on to or how much you get rid of. But we can give you a few tips for clearing your space and clearing your head this New Year. If you’re dealing with big clutter, it’s easy to get overwhelmed. Rather than looking at the whole project at once, try starting with one room or one specific area. Focus on one room at a time and try to stay focused on the job at hand. The hardest part about clearing out your space is deciding what to keep and what to let go of. Try making a list of things you can’t live without, the things you like but don’t really need and the things you never use. Prioritize and make some tough decisions. You’ll be surprised what you can live without! Once you’ve made the tough decisions, give us a call at Mr. Junk and set up a junk removal appointment! We’ll come to your home and take away furniture, old electronics and TVs, carpet, and all kinds of other cluttered messes. We take care of it all, big or small, no matter where you live in metro Atlanta.